Imagine that you've heated your kettle to an optimum temperature of 205 degrees Fahrenheit and poured the hot water over your favourite blend of Earl Grey tea. Sounds good? You are about to take a sip and then you realize that it isn't quite finished, and then you add a shot of espresso, a can of Monster energy drink, and 200 milligrams of medical grade morphine. 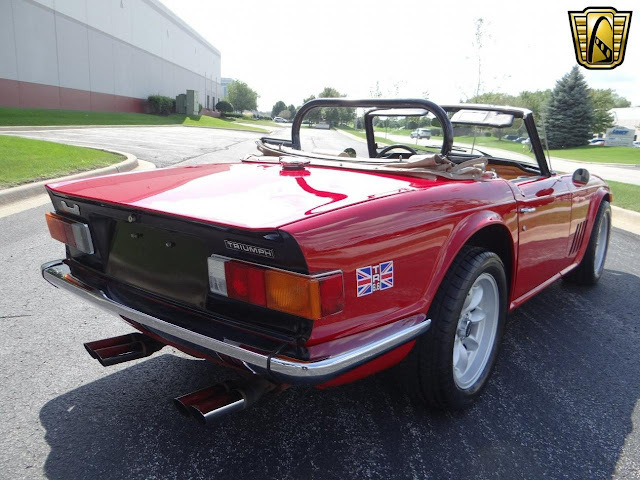 Find this 1973 Triumph TR-6 here on eBay offered for $23,595 buy-it-now or make-offer located in Tinley Park, IL. This looks like a standard TR-6 covered in a nice coat of paint and a set of sweet minilite style wheels, but it isn't a basic British classic in the least bit. 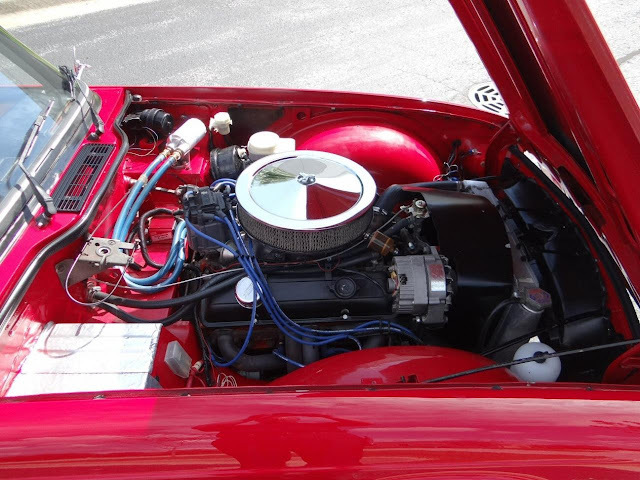 Under the hood is a 400 cubic inch Chevrolet small block V8 that is mated to a 5-speed manual gearbox and into a rear end borrowed from a Vette. 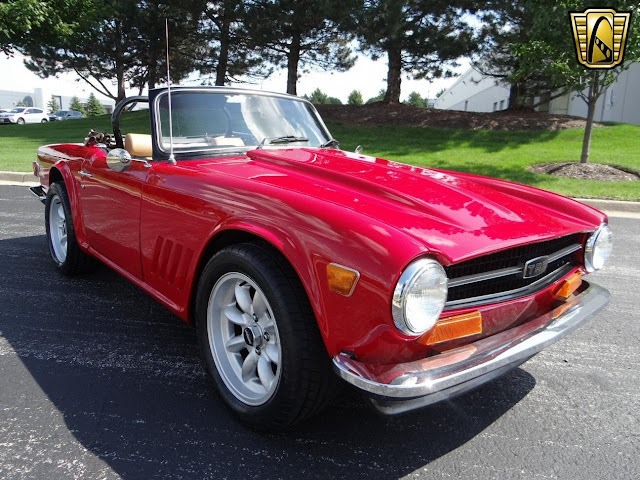 Aside from the roll cage (and probably a meaty exhaust note) this thing looks like any other Sunday driven old fashioned TR6. I wish someone could explain the attraction of Minilites to me. I never got it. I like the idea of a small sports car with a big V8. It looks like it could be a lot of fun to drive. However, the details look lacking. I'd spend thousands working out the stance, exhaust, wiring, panel gaps, convertible top and boot...all trying to match the high price. Maybe negotiate much lower and just drive the snot out of it as-is. 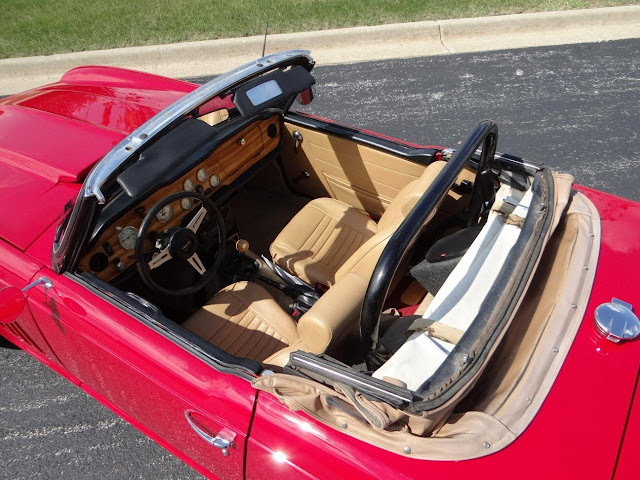 If the slats in the the front quarters aren't needed for heat reasons, I'd get rid of them. They remind me of a bad kit car. Its not stock, its bow-tie powered, I figured the 'gills' were an homage to the '67 Corvette? Agree on the mufflers needing to be further modified to be hidden better. Can't imagine the trunk is being used for much and could make a good home for a stealthier exhaust. They didn't run it hard in the video and looked like it might have scraped going into their garage. The additional weight of the iron block V8 would absolutely corrupt the otherwise fine handling handling of the TR6. I'd be singing the praise of a aluminum block LS1 swap, but this ain't one. Upon further review, and as a TR6 owner myself, I've gotta give the builder props for restraint. The hood scoop is amazingly low profile compared to other V8 conversions (I hate hood scoops on British roadsters) and he didn't overly personalize the body; it's largely stock. The dash is now zebrano wood but otherwise adheres to the original design which is a good one and the interior is factory. It might not be the sharpest tool for SCCA cone dodging events but it otherwise looks like a good vehicle for getting places in a hurry. With stock TR6's fetching $20k, this isn't entirely an unwarranted price for this one IF you were already considering building one of your own.